My trip to Walmart yesterday started off wonderfully. My wife didn't accompany me so I was able to shop in the appropriate direction which, as everyone knows, is counter-clockwise. She has been known to, without consulting me or without even offering a "fare thee well," sail off in the wrong direction, to my great distress. This makes the "produce" section the last stop and creates a most unstable experience. Anyway, I enjoyed my shopping. A young associate even listened politely to my suggestion that the Raman Noodles would best be placed alongside the condoms for more effective marketng. The world was a pleasant place. My cashier of choice wasn't working yesterday. Upon inquiry, I learned it was her day off and that they had failed to notify me beforehand. Consequently, I was forced to check out with a complete stranger. That's when it happened. This, this, this ... person began to rotate the grocery bag carousel in the wrong direction. Can you believe it? Well believe this then. A screaming man attracts a good deal of attention in Walmart. After I explained her transgression, of all things I was told that I am banned from Walmart. I'm not sure if it is all Walmarts or just the one that is the appropriate distance from where I live, but I am devasted. Please advise me as to how I can resume my shopping at Walmart. On your next visit, wear a freshly laundered pair of khaki pants and white shirt with a fashionable tie. Polish your shoes, tend your nails. make sure any tattoos are covered. Brush your teeth and, if any are missing, keep your mouth closed. Make sure you are wearing your pants high enough to cover the upper terminus of your buttocks, that your hair has been recently cut, and you are sans baseball cap. 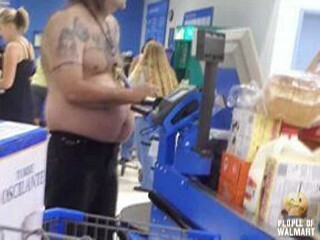 You will never be mistaken for a past Walmart shopper. Oh ... and ditch the ear buds and cell phone. - C.W.